My Shay And Blue Signature Scent: Black Tulip! Boy do I have a cute little story for you. After all this uproar about Tess Holliday on the front of Cosmo, I thought I’d take it upon myself to actively support her and buy a copy of the magazine. I’m not usually a womens magazine reader if I’m honest. There have been a lot of instances in the past where I’ve bought them and just seen them slating completely normal and natural things about peoples appearances or lives and it really bugs me. Anyway – that’s for another post and a whole other discussion! So I actually read the magazine and surprisingly enjoyed it! Upon flicking through the pages, I came across one with an advertisement for a perfume. But it wasn’t just any perfume, it was called BLACK TULIP. I was with Jake at the time and he can vouch for the fact that I honestly had a bit of a meltdown. The brand was called Shay and Blue and I remembered I had received a 10ml size of one of their perfumes in my Marks and Spencers beauty advent calendar last year! My mum is also a big fan of them and said she had come across the perfume before. I’ve been on my self-hosted site for just over a year now and I’ve worked with quite a wide range of brands but approaching people myself is something I’m still extremely inexperienced at. I just couldn’t let an opportunity like this go by, though! And I told myself even if they rejected my offer, I’d go and buy myself the perfume when I could as alongside the name of it, the description of the scent just sounded too perfect not to own. Off I went to google to hunt down the email address for the PR side of Shay and Blue and I sent over a short and sweet collaboration proposal. I’m not going to lie, I wasn’t expecting a reply. Shay and Blue are such a fabulous, luxury company and I thought I might be a bit too small of a blogger to work with the likes of them. 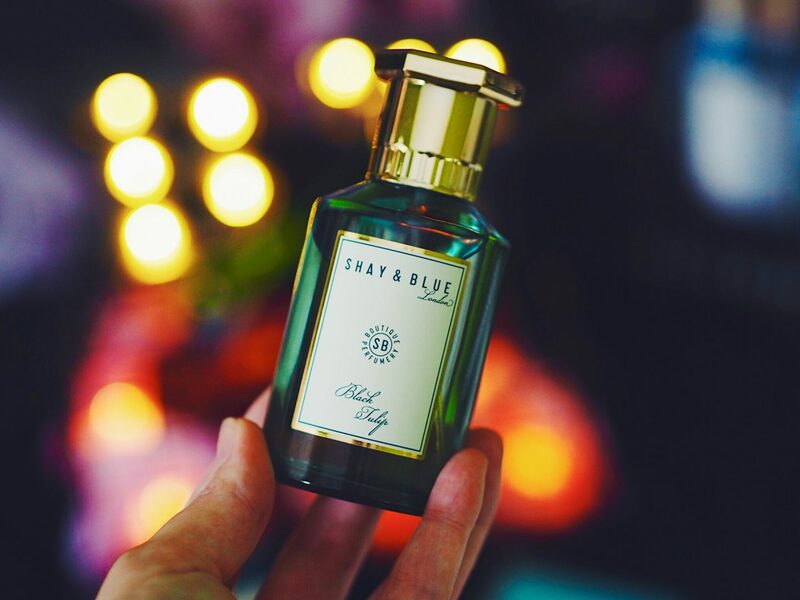 I awoke from a nap the next day after feeling really unwell to an email from a lovely lady named Philippa saying Shay and Blue would absolutely love to send out a 100ml bottle of Black Tulip for me to review! *Insert video of me running round the house screaming*. Black Tulip turned up in a gorgeous box a week later and I haven’t stopped wearing it since! 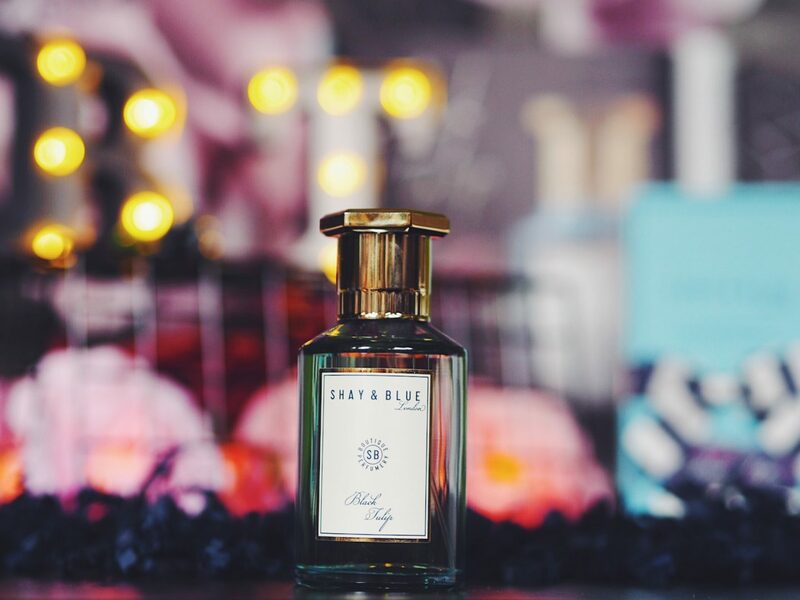 Established in London in 2012 and now a multiple award-winning business, Shay and Blue began with the aim to create something unique, boutique and unapologetically chique. Unlike a lot of mass produced and quickly churned out products nowadays, they focus on working with real flowers, fruits and spices to derive and produce natural and individual fragrances. Their blends are hand harvested, hand weighed, hand distilled and then left to develop for a few months before being decanted into their signature smoky blue bottle. If this wasn’t a reason enough to invest in one of their gorgeous designer-esque products, they’re also cruelty-free, paraben free and phthalate free! It’s not often that I invest in new perfumes as I’m usually one of those that finds a scent and sticks to it. When it comes to fragrances, I tend to stick to strong, sweet or spicy floral scents such as the likes of Olympéa by Paco Robanne which has been my occasion perfume for a year or two now. On researching the “Black Tulip” fragrance and seeing it described as a rich and fresh floral scent with smooth white chocolate undertones, I couldn’t actually think of something that sounded more perfect. Of course, you can never guarantee you will like a scent until you experience it, though. The fragrance arrived in a beautifully presented cardboard box with the companies signature stripes and logo on. Buried in the shred alongside a product book was a gorgeous two-tone blue box with a striped ribbon on. The inside of the box matched the ribbon but with horizontal stripes. The first thing I thought was how extremely luxurious it looked and that they certainly live up to their label of a boutique perfume company. Now onto the scent. The top notes are snowdrops and cyclamen which are the fresh elements of the perfume. On first spritzing it, the scent is really quite strong and crisp and definitely packs a punch. After around 15 minutes it settles into the most gorgeous warm and rich scent which is when the heart notes come out to play. This is the black tulip and plum notes seeping their way out and bringing a real intertwined and rounded scent. Last but not least, the base notes are the white chocolate and soft woods which are the smoothest and sweetest of the bunch. I feel these really come out after about an hours wear and is when I surprisingly seem to get complimented most on it. My favourite part of it is somewhere in-between the base and the heart notes when the sweet and rich are in unity at their strongest. I think one of my favourite things about this perfume is that it’s suitable for the day time aswell as evening wear. It’s not too strong at all and is such a wonderfully different scent that I can’t wait to get full use out of. The only thing I’ll worry about is using it up too quickly! This beautiful perfume is £55 for 100ml bottle which I think is extremely reasonable for a hand-distilled product, not to mention the fact it’s an Eau De Parfum formula. 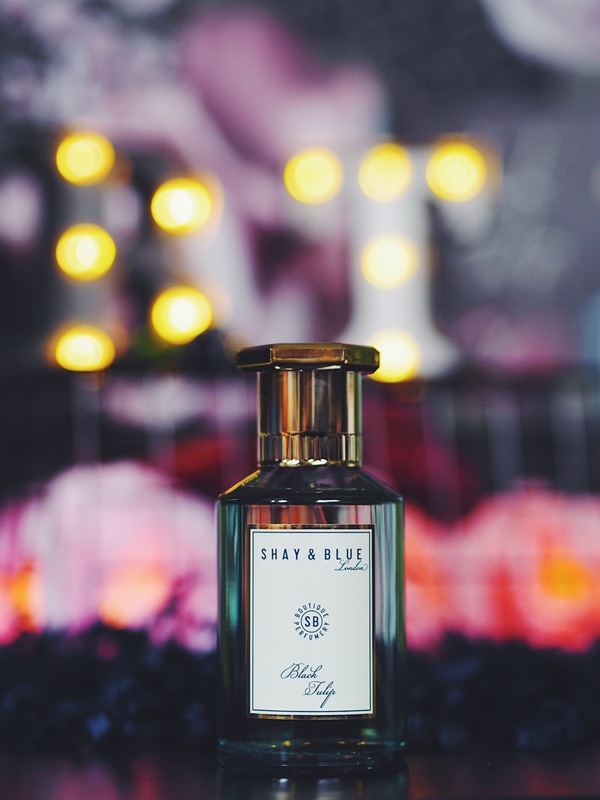 I am so extremely intrigued by Shay and Blue’s products and will be putting all of the Black Tulip products on my Christmas wishlist as they also do a body and hand lotion, body and hand wash and a rich hand cream. I also expect at this rate, I shall be needing another bottle of perfume by then, too! There are a few other fragrances I’m highly intrigued by the sound of too such as “Sicilian Limes”, “Salt Caramel” and “Almond Cucumber”. Have you tried anything from Shay and Blue yet? "Colectomy Surgery & A Recovery Update!" "Get Well Soon Gifts From Bomb Cosmetics!" First of all, a massive congratulations for working with a brand you reached out too! Secondly this post is written beautifully! This is amazing! I love the bottle! Also I love the whole look of your blog! Your photos are gorgeous in this and its amazing that your blog name is the same as the perfume!! i’ve never heard of Shay and Blue. Their packaging is lovely tho. Fyi on my browser the background makes it rough to read the post. Congratulations on the collab – this perfume sounds right up my street! I love the smell of cucumber too so I’m really intrigued by that other one as well! This sounds like such a lovely scent! I will have to look for it for sure! The bottle is indeed chic and gurrrrl your description diffuses the scent right under my nose 👃 I’ll check them online and grab one. I also want to say, your blog is very beautiful ❤️ Thanks for this post! Yey for being brave and reaching out to brands! That still scares me, but it’s amazing when you do get a reply and they agree. Such a boost for your confidence, so you must have been so excited! You’ll have to fill me in the the Tess Daly stuff, as I haven’t heard anything about that? But onto the perfume. I love the bottle! Simple is always best in my opinion and it really does look so luxurious. I think it’s that gorgeous blue toned bottle. And I have NEVER heard of a perfume having white chocolate tones to the scent, so I’m gonna have to find this and sample it because that sounds amazing! I remember seeing your tweets about finding this perfume; some things are meant to be. Well done on seeking collabortions. I used to be nervous at first, but then I just realised that it’s only a small rejection. This fragrance sounds so nice! Ihave a similar taste to you with sweet and spicy scents, but white chocolate undertones?! Yes please! I am going to have to seek out some Shay and Blue fragrance because salt caramel sounds too nice to miss out on. ahwefnrirg4fniofrm! Alice, these photos are absolutely stunning! Thanks so much 😊 I worked so hard on them!